Day by day, the sun gets harsher and temperature rises. You are exposed to not only 1 but 5 Sun Dullness problems now. Your regular face wash is not designed to handle these 5 Sun Dullness Problems (Dark Spots*, Sweat & Oil, Dark Skin, Tanned Dull Cells and Tired Skin). Powered by maximum Icy Coffee Bean Scrubs, the Energy Charge Icy Gel Face Wash is the most Icy face wash** that is designed to fight 5 Sun Dullness Problems. Get Bright + Energized skin. *caused by dirt and dust. For best results, we recommend using this face wash 2 times a day with Energy Charge Gel Moisturizer. Buy Now! Ponds is a global skin care expert that has a presence in over 50 countries including Asia (Philippines, Thailand, Indonesia, China, Vietnam, Korea and Japan) and USA - making it a skin care brand to reckon with. The brand boasts of state-of-the-art R&D facilities led from POND’S Institutes at New York, Tokyo and Madrid, helping it create breakthrough innovations in face care. POND’S has extended its skin care offerings to men with the launch of the POND’S Men range which is available across in China, Indonesia, Thailand & Philippines and now in India. The POND’S philosophy is based on the application of leading-edge technology and giving customized solutions for different skin care needs. By combining this with an intimate understanding of the evolving skin care needs and requirements of consumers, POND’S delivers results that can be seen and felt. Explore the entire range of Face Wash available on Nykaa. 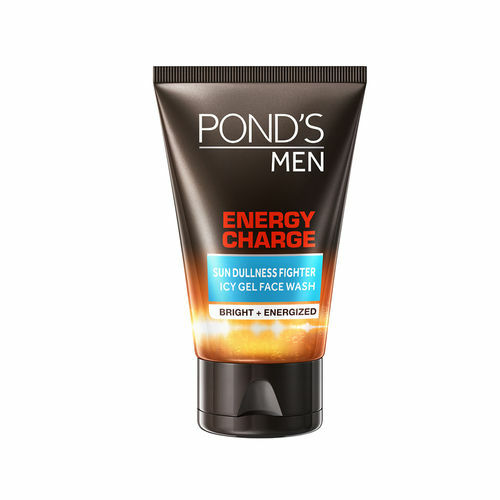 Shop more Ponds products here.You can browse through the complete world of Ponds Face Wash .Alternatively, you can also find many more products from the Ponds Men Energy Charge Icy Gel Face Wash range.